Newsday: Greg Logan writes a state of the Islanders article with comments from general manager Garth Snow on the status of his free agents, Wade Dubielewicz rejecting the teams contract offer, the upcoming draft and who he is close to resigning or will qualify among his restricted free agents. * In short, no offers to Satan, Vasicek, Fedotenko, Berard because the team does not want to load up on players who could take spots from the younger players. * Tim Jackman is close on a two-way contract extension. * Jeff Tambellini, Frans Nielsen and Ben Walter will receive qualifying offers along with forwards Sean Bergenheim, Jeremy Colliton and defenseman Bruno Gervais. been a two way offer according to Mr Logan) and now is being blamed for DiPietro's workload early because he was in poor shape and could not be trusted by the coaching staff to play. * The Isles interviewed about 100 prospects in preparation for the draft June 20-21 in Ottawa but the draft board is still not set with another two rounds of amateur meetings. * Mr Logan speculates Aaron Johnson is not likely to receive a qualifying offer because he can go to arbitration and possibly win a one-way contract to secure one of 23 NHL roster spots. No one is sure of the kind of exact contract Garth Snow offered but it sure seems Garth Snow just threw Wade Dubielewicz under the bus and the backup job could now go to Joey MacDonald because that sure seemed like a see ya later if ever I read one. If he was out of shape there was plenty of opportunity for him to go to Bridgeport and it seems a bit of a reach with a team playing three games in twenty games early in season that Dubie was going to see any work. After his two spot starts early he proved to be a solid goaltender. Bottom line if Garth Snow or the coaching staff was not happy with his conditioning he easily could have sent him down or outright placed him on waivers. You do not offer a multi-year contract to any player if you feel his reporting out of shape hurt your team. This seems like sour grapes on Snow's part and not classy to release this to the media after a contract negotiation. You thank him for his efforts and move on. To be fair to the general manager for those who recall in several articles Wade Dubielewicz promised he would report to camp in the best shape of his life here. 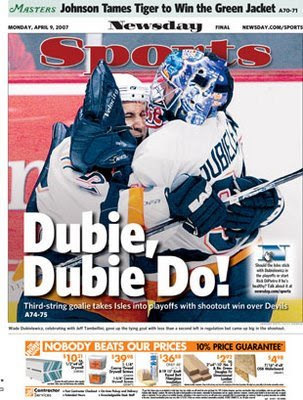 On April 10th Garth Snow in Newsday's Islander blog talked about Dubie not entering camp in shape and that he selfadmittedly struggled early so this is not just about a player turning down a contract recently as the gm also praised his work later in the season as he talked about a goaltending rotation here. What does it say about what the gm thinks of Joey MacDonald if a multi-year offer was made to Wade Dubielewicz? I will be very interested in what Ted Nolan has to say on this given Nolan stuck with Dubielewicz after DiPietro returned to the club after his grandmothers funeral for a critical Ranger game. It's a fair guess Joey MacDonald becomes the backup goalie with a one-way contract but in today's NHL backup goaltender are not a huge priority. No surprise the Isles are qualifying almost all the restricted free agents & not making any offers to the unrestricted free agents. Snow's trend seems to be to make an offer and it's not good enough move on. Not like I want to go off on Greg Logan again folks but being it's June 1st and the deadline is here to sign these players, you think he would have gotten at least a no comment from the general manager on Ridderwall or Johansson? For what it's worth I asked Mr Fornabaio who of course had a link to the Newsday article in his blog already what the rules are in terms of games/years on how Dubie even if signing a two way contract would not be exposed to waivers? I'm just not sure on these rules. senior vice president of sales, marketing and operations Chris Dey about next season and beyond. I checked the LI Business News for the meeting summary the last few days, not sure how Mr Dey's comments slipped by or if this publication does update daily? First time I have read the Isles could be interesting in hosting an NHL draft but this overall project will require construction that could run for a full decade.